This week I released my Dagda pattern. I love this pattern and all the trials and tribulations that it gave me were worth it. I was really pleased to get to the point of releasing it and letting it go off out there. After the release of Dagda the remainder of the week was spent pretty much on the admin side of things. My website needing updating which is all done now and can be seen here. I also had October’s newsletter with a special email only discount for my subscribers and last but not least I was worked on the first draft of my Fíorghrá pattern. If you happen to follow me on instagram you may have seen updates about that. The last of the sample knitting is done and it is ready for blocking now so the pattern should sometime this week head off to my tech editor. I worked on Streusel last night on the decreases and another hour or two today should finish it off, then it will be onto the blocking mats as well with this one. This is what it looks like at the moment. I didn’t get to start the second Forest Moon of Endor sock but with the sample knit complete and Streusel going to come off the needles later today I expect to be casting that on sometime later tonight and then of course I need to make the final decision on Leonore and Fledermaus, I have to say Fledermaus is edging it only because it is a far more interesting sock and I have a couple of solid colours that I’m trying not to dip into until all those variegated, self striping yarns are used up but I’m not sure I can hold out and not use one for either of these sock patterns. Dagda look lovely! I prefer mitts that aren’t too patterny across the palms! Hopefully we see modelled photos of Streusel next week. Bet it’s going to look gorgeous worn! The Dagda fingerless gloves are beautiful, Ruth, as are those Fledermaus socks. I love those. I, too, hope to see a modeled picture of the Streusel. What a sweet looking shawl that is. Oh streusel is looking so fine, I love that yarn. 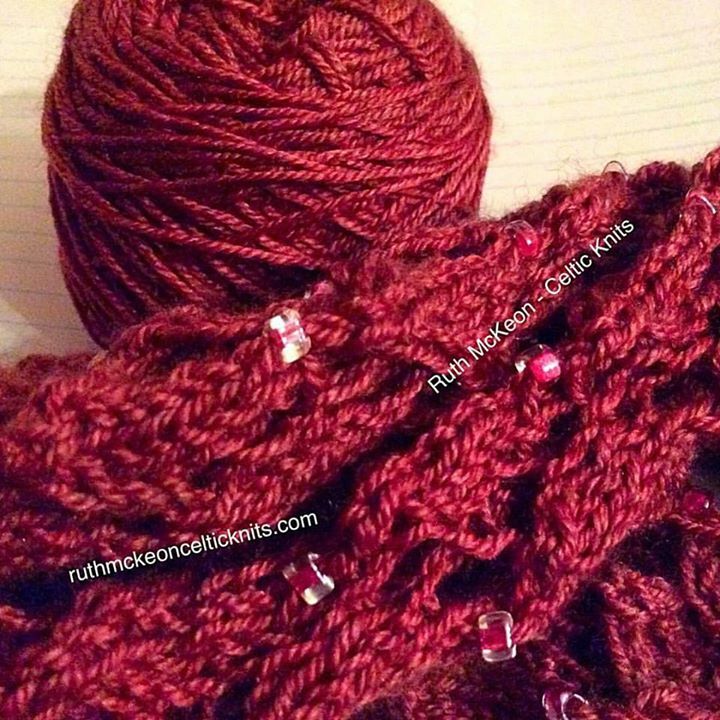 I have been following your beading progress on instagram and it is gorgeous, such a beautiful red. Thanks Lucy, I love the beaded piece even if I’m saying it myself. I like your mitts design, Ruth. I like the feminine edgings and I like the wavy stitch pattern up the sides which remind me how we take life in stride. Thank you Stef, the edges were just that, flared to add that feminine touch and the wavy lines add great strength to the pattern as well as movement. Good lord, you’re a busy little bee! I can’t keep up with you Ruth! You have accomplished alot….and Dagda is gorgeous and I am sure many knitters will come to appreciate all the toil you went through to come up with a beautiful and well written pattern. I hope to get my post up tonight–I just can’t keep up with my blogging anymore. Thank you Kim and I know from last year how hard it is to keep up with the blogging, things will slip into place and you’ll find your groove once again.